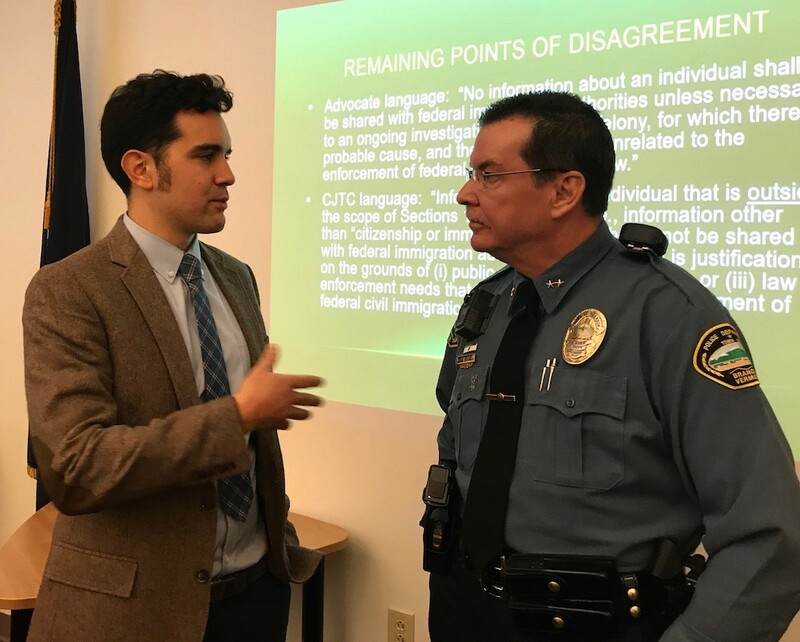 Jay Diaz, a staff attorney for the Vermont chapter of the American Civil Liberties Union, speaks with Brandon Police Chief Christopher Brickell. Vermont’s Criminal Justice Training Council on Tuesday unanimously approved an updated Fair and Impartial Policing policy to serve as a model for law enforcement agencies across the state. The policy is meant to prevent cops from discriminating while interacting with the public, but civil liberties and immigration advocates say the new rules actually remove protections from a 2016 version. The changes allow local police to tell federal immigration officials if they discover that victims or witnesses of a crime are in the United States illegally. The previous version encouraged officers to avoid doing so. The original earned Vermont Public Safety Commissioner Thomas Anderson a letter in November from the U.S. Department of Justice, which threatened to withhold federal funding if the state did not update its policy. Miguel Alcudia, who attended the council’s meeting with the advocacy group Migrant Justice, said he was unhappy with the result. “Many of us, if we’re victims of a crime or witnesses to a crime, we’re going to have fear to come forward and denounce that crime because instead of focusing on the criminal activity, they’re going to be able to focus on the victim’s immigration status,” he said through an interpreter. Alcudia himself was detained by federal Immigration and Customs Enforcement officers in September 2016 while leaving the dairy farm on which he worked. Advocates said the policy unnecessarily opens the door for discriminatory policing, but law enforcement officials said they’re bound by federal law. Christopher Brickell, the chair of the Vermont Criminal Justice Training Council and the Brandon police chief, said it’s illegal to enact a policy that prohibits local police from passing information to the feds. The council’s unanimous vote belies concerns among police, and even within the Criminal Justice Training Council, that the state’s Fair and Impartial Policing policy should actually be separate from state policy that governs immigration enforcement. Colchester Police Chief Jennifer Morrison made an impassioned plea to the council to separate the two concepts. She said police in Vermont encounter immigration law very rarely — especially officers far from the Canadian border — but they are duty-bound to do their jobs in a fair and impartial way all the time. Brickell said the council’s mandate from the legislature was to update the existing Fair and Impartial Policing policy, which was adopted in 2016. That version addresses immigration enforcement, and lawmakers did not direct the council to form separate immigration policy. Will Lambek, an organizer for Migrant Justice, said the August traffic stop illustrates exactly why immigration enforcement policy and Fair and Impartial Policing are inseparable.